Identification: Moyle (1976); Becker (1983); Page and Burr (1991); Jenkins and Burkhead (1994). Native Range: Atlantic Slope drainages from New Brunswick to Edisto River, South Carolina; Great Lakes, Hudson Bay, and upper Mississippi basins from Quebec and New York west to southeastern Manitoba and North Dakota, and south to northern Kentucky and Missouri (Page and Burr 1991). Table 1. States with nonindigenous occurrences, the earliest and latest observations in each state, and the tally and names of HUCs with observations†. Names and dates are hyperlinked to their relevant specimen records. The list of references for all nonindigenous occurrences of Lepomis gibbosus are found here. Means of Introduction: Intentional stocking for sportfishing. Trautman (1981) reported this species was originally absent from the southern unglaciated part of Ohio. However, he implies construction of canals gave them access to those areas and, furthermore, millions of Pumpkinseeds were stocked in southern Ohio between 1920 and 1950. Status: Established in most locations where introduced. Extirpated in Arizona (Minckley 1973). Reported in Kansas, but failed to become established (Cross 1967). Impact of Introduction: Pumpkinseeds will hybridize with most other Lepomis, especially with bluegill and green sunfish. The result is usually fast-growing, sterile male hybrids (Moyle 1976). Casal (2006) listed the Pumpkinseed among the top ten introduced fish species with adverse ecological effects. It has been reported to be responsible for the decline of other fish species (Welcomme 1988) as well as gastropods (Osenberg et al. 1992). Van Kleef et al. (2008) found that macroinvertebrate abundance was 83% lower in areas invaded by Pumpkinseeds in the Netherlands. Kynard (1979) found that decline in abundance of threespine stickleback (Gasterosteus aculeatus) was related to an increased abundance of Pumpkinseeds in Wapato Lake, WA. Remarks: Sigler and Miller (1963), Sigler and Sigler (1987, 1996) make no mention of Pumpkinseeds in Utah. Although Burr (1980) lists this species as probably introduced to the Ohio River in Kentucky, resulting from escapees from commercial fishing lakes and farm ponds, Burr and Warren (1986) believed they were more likely strays from the upper Ohio River. Menhinick (1991) reports Pumpkinseeds as native and introduced in all remaining drainages (other than New and Tennessee) in the state. It is unclear if these introductions are within their native range in those drainages or outside their native range. Cross et al. (1986) also listed the Pumpkinseed as introduced into the Kansas River drainage but did not indicate which state. No records were found for this drainage in Kansas (Lee et al. 1980 et seq. ; Cross and Collins 1995) or Nebraska (Lee et al. 1980 et seq.). However, Cross (1967) stated that he believes all previous records of Pumpkinseeds in the Kansas drainage are actually L. megalotis. He gave a discussion of reasons for the misnomer and the perpetuated error. However, he did give one "recent" (circa 1967) record from Johnson County (KU 10274) which may have been in the Kansas drainage. This could be the basis for the Cross et al. (1986) report. Casal, C.M.V. 2006. Global documentation of fish introductions: the growing crisis and recommendations for action. Biol Invasions 8:3–11. Kynard, B.E. 1979. Population decline and change in frequencies of lateral plates in threespine sticklebacks (Gasterosteus aculeatus). Copeia 1979(4):635-638. http://www.jstor.org/stable/pdfplus/1443870.pdf. van Kleef, H., G. van der Velde, R.S.E. Leuven, and H. Esselink. 2008. 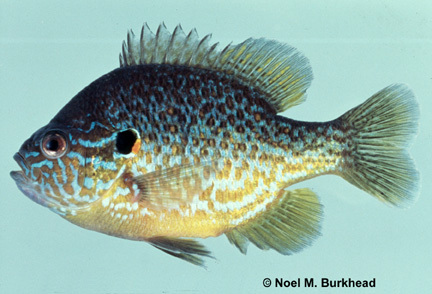 Pumpkinseed sunfish (Lepomis gibbosus) invasions facilitated by introductions and nature management strongly reduce macroinvertebrate abundance in isolated water bodies. Biological Invasions. 10:1481-1490. Welcomme, R.L. 1988. International introductions of inland aquatic species. FAO fisheries technical paper no. 294. Food and Agriculture Organization of the United Nations, Rome. Author: Fuller, P., and Cannster, M.